Turnkey offices. Seamless tech. We take your work seriously. Whether you require temporary office space or full-time shared office space, our professional staff will help you choose the best option for your business. A virtual office provides your business with a professional work environment with low overhead costs and flexibility to adjust your services as your business grows. All of our conference spaces (18 across our two locations) come fully-equipped with state-of-the-art technology and equipment at no additional charge! Save up to 60% per Month! View an infographic comparing the cost of AdvantEdge office space versus traditional office leasing situations to see how you can save. Owner operated: Onsite management and support staff available any time. No red tape or corporate infrastructure to navigate; management decisions made on-the-spot. Friendly receptionists: Our receptionists function as an extension of your company, and the same familiar faces answer your phone calls, greet your visitors and handle your mail. Complete customization: Your workspace, your way. Want your walls red to match your logo? Consider it done. Our focus is on finding the ideal solution for your company's workspace. Inclusive, up-front pricing: The cost of your investment is clear, simple and transparent. Monthly invoices are easy to read and contain no surprises. Culture and community: Friday morning bagels and fresh fruit, monthly EdgeTalks, networking events and Happy Hours. Flexible (flex) terms: Experiencing massive growth? We have your back. Our terms are flexible to help you scale responsibly. Individual attention and personal service: Our commitment to your success extends beyond the routine. We work as an extension of your company, and because we are owner-operated we can respond to your needs quickly and efficiently. 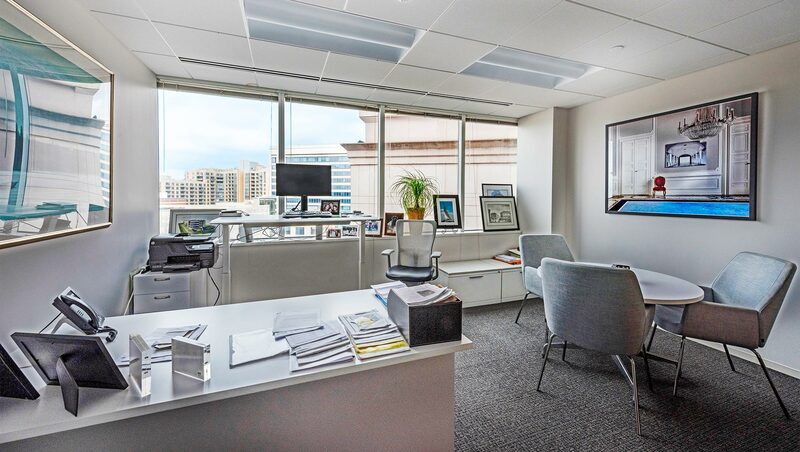 30+ years of experience: We are the longest operating workspace provider in DC. We have worked with thousands of businesses over the years; rely on our experience instead of learning through trial and error! "I have used every kind of mobile office space in DC... [and] AdvantEdge is the most professional, the best quality, highest end with the best price for anyone who wants to impress a client...I have visited both of their locations (L Street and Friendship Heights) and find the staff willing to bend over backwards to help with conference room space for workshops or day offices...I can't recommend it highly enough.."
"I am often amazed at the great service that we receive...Tiffany is often seeking creative ways in which to meet a need. She goes beyond being professional but anticipatory in service...Our business has grown consistently...[and] the flexibility with which they have supported our growth frees us up to plan for our business...the aesthetics of the space.It's a beautiful location that provides a great image for clients." "I have led many meetings in AdvantEdge conference rooms. The meeting space is top notch and the staff is incredible! Everyone is professional and responsive to our every need...They always ask, "What can I do to help?" so we can focus on the business of running the meeting. The space is beautiful and adaptable. We love running our meetings in this space and can't recommend it more highly!" Chair / Vistage Worldwide, Inc.